Reference number for this case: 20-nov-54-Blaison. Thank you for including this reference number in any correspondence with me regarding this case. 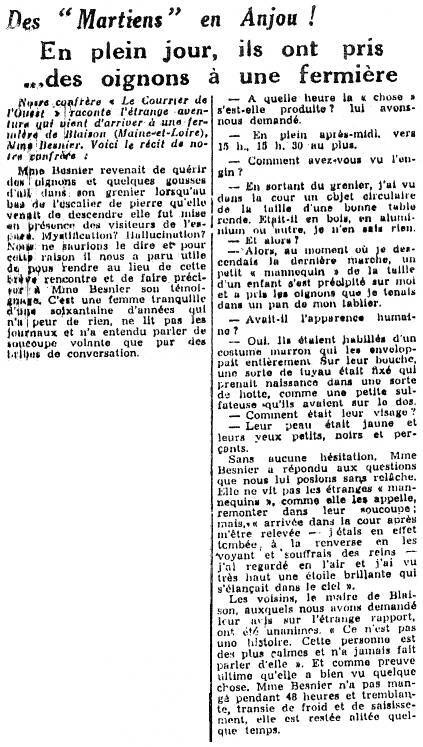 Journalists from Le Courrier de l'Ouest, a regional newspaper, told about an encounter which occurred to Mrs. Besnier, a farm woman in her sixties, at her a farm of Le Petit Cotillon, Blaison, the Maine-et-Loire, France, on November 20, 1954, in the middle of the afternoon around 03:00 p.m. and no later than 03:30 p.m.
After fetching onions and some cloves of garlic in her attic she was at the bottom of the stone staircase which she had just walked down, When she saw a circular object of the size of a "respectable round table" in the farm yard. She had difficulties finding the words to describe the material it was made of, saying that she can't tell if it Was it made of wood, or aluminum or anything else. Then, at the time when she descended the last step, a small "mannequin" of the child-size rushed onto her and took the onions which she held in a side of her apron, and she also saw an unspecified of other such beings in the court. They had a human appearance but their skin was yellow and they had small, black and piercing eyes. They were dressed with a brown costume which entirely wrapped them, with some kind of back pack, "as some sort of small sulfate sprayer which they had on the back", and on their mouth, a kind of pipe was fixed; which came from a sort of hood. As the being rushed at her and took her onions, and as she saw the other beings, she fell on her back and hurt herself, so that she could not see them go up in their saucer; but after she stood up again and looked up in the sky, she saw, very high "a brilliant star" which sprang in the air. The journalist or journalists indicate that they met Mrs. Besnier and asked her for some specifics about her testimony. She answered Without any hesitation. They noted that she is a quiet woman who is afraid of nothing and had heard of flying saucer only by bits of conversations. The journalist or journalists indicate that the neighbors, and the mayor of Blaison, whom they asked for their opinion, were unanimous in stating that as Mrs. Besnier is a calm woman who "never made any fuss", and that the story was not invented. After the encounter, Mrs. Besnier did not eat during 48 hours, and "trembling, stiff with cold and seizure", remained confined to bed some time. Mrs. Besnier returned from fetching onions and some cloves of garlic in her attic when at the bottom of the stone staircase which she had just walked down, she finds herself in the presence of space visitors. Mystification? Hallucination? We could not tell, and for this reason it appeared useful to us to go to the location of this short encounter and to get Mrs. Besnier who give some specifics about her testimony. She is a quiet woman of about sixty years old who is afraid of nothing and had heard of flying saucer only by snatches of conversations. - A what time did "the thing" occur? We asked her. - In the full afternoon, at about 03:00 p.m., not later than 03:30 p.m.
- How did you see the craft? - While leaving the attic, I saw a circular object of the size of a respectable round table in the court. Was it made of wood, or of aluminum or of anything else, I do not know at all. - Then, at the time when I descended the last step, a small "mannequin" of the size of a child rushed onto me and took the onions which I held in a side of my apron. - Did it have a human appearance? - Yes. They were dressed with a brown costume which entirely wrapped them. On their mouth, a kind of pipe was fixed which came from a sort of hood, as some sort of small sulfate sprayer which they had on the back. - How was their face? - Their skin was yellow and they had small, black and piercing eyes. Without any hesitation, Mrs. Besnier answered the questions that we asked her without slackening. She did not see the strange "mannequins," as she calls them, go up in their saucer; but "when I arrived in the yard after standing up again - for I fell on my back when I saw them and it hurt - I looked in the sky and I saw very high a brilliant star which sprang in the air." The neighbors, the mayor of Blaison, which we asked for their opinion on the strange report, were unanimous. "It is not an invented story. This person is calm and never made any fuss." And as an ultimate proof that she really saw something, Mrs. Besnier did not eat during 48 hours, and, trembling, stiff with cold and seizure, she remained confined to bed some time. The French ufologist Jean Sider is the researcher who found out about this case in the regional press. He gives a summary in his book "Le dossier 1954 et l'imposture rationaliste," sticking to the source. A Mrs. Besnier was returning from fetching onions and some garlic cloves in her attic at the bottom of the stone staircase and as she walked out of the attic she saw a circular metallic object apparently on the ground in her courtyard. It appeared to be made out of aluminum. As she descended the last step a small figure the size of a child rushed onto her and took the onions, which she held in a side of her apron. Other humanoids now became visible. The humanoids were human in appearance and were totally wrapped in a brown custom. On their mouths they carried a kind of pipe that connected into a sort of hood and apparatus attached to their backs. Their skin was yellow and they had small black piercing eyes. The witness ran and apparently did not see the humanoids return to their "saucer". Mrs. Besnier did not eat for 48 hours after the incident and remained confined to bed for some time. The author indicates that in Le Petit-Cotillon, in Blaison in the Maine-et-Loire, on November 20, 1954, an object in the shape of a mushroom and two small dressed up mannequins of 1.10 meters appeared, and the farm woman who witnessed it was paralysed. One of the beings took the onions that she held in the hand and she lost the notion of time, which evokes for the author a period of "missing time". When she becomes conscous again, she observed a luminous point with a trail in the sky, and she felt a faintness during 48 hour. The author adds that the investigation seems to make it possible to exclude the idea of a hoax and that similar cases in Italy exclude an hallucination, and thus, it was the military who secretly shot at the witness with microwaves or maser rays to make her have these hallucinations. The author does not indicate sources. Luc Chastan indicates that in Maine et Loire in Blaison on November 20, 1954 at 15:00 hours, "an old woman goes up in her attic by an external staircase at the lcoation Le Petit Cotillion, to get onions and garlic. While going down again she sees in the yard of her farm an object in the shape of a mushroom and the height of a table. From the object emerge two entities of a size of approximately 1 m 10. They are dressed of a maroon costume entirely wrapping them a pipe is fixed on their mout e which starts from a kind of small tank that they carry on the back. Their skin is yellow and they have small black eyes. They a approach the old woman who is paralysed by a strange force. One of them seize the onions which the woman held in the side of her apron. Then they remove their pipes (uncover themselves according to the witness) and pronounce some words that she does not understand. The woman loses consciousness. When she recovers she then observes a luminous point which goes up in the sky with a trail behind. The woman remained 48 hours without eating and stiff with cold she remained with the bed during some time." The website indicates that on 20 November 1954 at 15:00 in Blaison, France, "Disc lands at farm, two short humanoids exit. one takes onions from puzzled witness. Possible missing time." The website adds: "Close encounter with a an unidentified craft and its occupants. One disc was observed on a farm for over 60 minutes. Two dwarves were seen." And: "A metallic mushroom-shaped object landed in a barnyard, two short humanoids wearing silvery combination suits and helmets exit the object, and one takes some onions from the paralyzed witness. The beings speak several unintelligible words. Possible missing time." The sources are indicated as "Hatch, Larry, *U* computer database, Author, Redwood City, 2002" and "Rosales, Albert, Humanoid Sighting Reports Database". The authors indicate that on November 20, 1954 in the Maine-et-Loire, Mrs. Besnier, aged 60, was climbing in her attic by an external staircase to get some onions and cloves of garlic when while coming down again she saw in the farm yard an object resembling a giant mushroom. Two beings in diving-suit with breathing apparatuses, approximately 1.10 meters tall, came out and approached the old lady who noted that she could not move. One of the beings him took her onions. The only thing that Mrs. Besnier next remembers is a luminous point in the sky with a shining trail behind. The witness was unable to eat during 48 hours and stiff with cold and seizure she remained confined to bed for some time. The authors indicate as source "Jean Sider, 'Le Dossier 1954', Ramuel, 1997". *Nov. 20, 1954 - At three o'clock in the afternoon Mrs. Besnier was returning from fetching some onions and garlic cloves from storage in Blaison, Maine-et-Loire, France. As she walked out from the cellar she saw a circular metallic object that had landed in her farm's courtyard. It appeared to be made out of aluminum. A small being, the size of a child, rushed at her and took the onions, which she held in a fold of her apron. Other short humanoids now became visible. The humanoids were human in appearance and were totally wrapped in a brown costume. In their mouths they carried some kind of pipe that connected to a sort of hood and breathing apparatus attached to their backs. Their skin was yellow and they had small black piercing eyes. Mrs. Besnier ran away and did not see the humanoids return to their “saucer”. Mrs. Besnier could not eat for 48 hours after the incident and remained confined to her bed for some time. (Sources: Jean Sider, Dossier 1954 et l'Imposture Rationaliste, p. 226; Lumieres dans la Nuit, issue # 325; Albert S. Rosales, Humanoid Contact Database # 2398, citing LDLN). A Mrs. Besnier was returning from fetching onions and some garlic cloves in her attic at the bottom of the stone staircase and as she walked out of the attic she saw a circular metallic object apparently on the ground in her courtyard. It appeared to be made out of aluminum. As she descended the last step a small figure the size of a child rushed onto her and took the onions, which she held in a side of her apron. Other humanoids now became visible. The humanoids were human in appearance and were totally wrapped in a brown custom. On their mouths they carried a kind of pipe that connected into a sort of hood and apparatus attached to their backs. Their skin was yellow and they had small black piercing eyes. The witness ran and apparently did not see the humanoids return to their “saucer”. Mrs. Besnier did not eat for 48 hours after the incident and remained confined to bed for some time. Mrs. Besnier, 60, climbed into her attic by an outside staircase to look for onions and some garlic cloves. Going down the staircase she saw a strange object in the courtyard of her farm, a sort of giant mushroom of the height of a good round table made of a material that she could not identify. Two small figures about 1.10 m tall were dressed in a brown costume that enveloped them completely. A kind of hose was fixed on their mouth, which arose from a kind of hood like a small sulphate tank which they carried on their backs. Their skin was yellow and they had small, sharp black eyes. They approached Mrs. Besnier, who felt unable to move, as if paralyzed by a strange force. One of the little creatures got hold of the onions that she held in the side of her apron. Then the beings unmasked (?) and uttered some words that she did not understand. It seems then that she lost the notion of time elapsed or that she fell unconscious. In any case, when she came back to her senses, she saw only a luminous dot rising in the sky with a brilliant trail behind. Julien Gonzalez remarks that the journalists who met Mrs. Besnier presented her as a quiet woman who did not read the newspapers and only heard of the flying saucers by snatches of conversation. The mayor and the neighbors, questioned, certified that Mrs. Besnier is a calm person who never caused any fuss. One of the articles states that as a result of this incident, she did not eat for 48 hours and that "chilled of cold and seizure, she remained bedridden for some time." The sources are indicated as Le Courrier de l'Ouest for November 24, 1954 and November 28, 1954; Les Nouvelles de Bretagne et du Maine dor November 26, 1954; Jean Sider, "Le dossier 1954 et l'imposture rationaliste", pages 226-227. See case file in the CE3 catalogue. [---] indicates sources which I have not been able to read yet. [---] Article in the regional newspaper Le Courrier de l'Ouest, France, page 2, November 24, 1954. [nb1] Article in the regional newspaper Les Nouvelles de Bretagne et du Maine, France, page 4, november 26, 1954. [---] Article in the regional newspaper Le Courrier de l'Ouest, France, November 28, 1954. [---] Article by Jean Sider in the ufology magazine Lumières Dans La Nuit (LDLN), France, #325, January/February 1995. [js1] "Le Dossier 1954 et l'Imposture Rationaliste", book by Jean Sider, Ramuel publisher, France, page 271, 1997. [---] Ufology magazine Lumières dans la Nuit (LDLN), France, #325, January/February 1995. [ki1] "Ce Qu'ils Ont Vu à l'Intérieur des Soucoupes Volantes", book by Daniel and Fabrice Kircher, Le Temps Présent publisher, France, page 100, 2008. [gz1] "RR3 - Le Dossier des Rencontres du Troisième Type en France", book by Julien Gonzalez, Le Temps Présent publishers, France, pp 163-164, 2014. 0.1 Patrick Gross September 6, 2007 First published. 1.0 Patrick Gross June 11, 2009 Conversion from HTML to XHTML Strict. First formal version. Additions [lc1], [ud1], [ki1]. 1.2 Patrick Gross November 22, 2016 Addition [ta1]. 1.3 Patrick Gross February 21, 2017 Addition [gz1]. 1.4 Patrick Gross November 26, 2018 Additions [lh1], [pr2].